Showroom Shine to Brushed & Polished Stainless Steel surfaces. A premium water-based product that gives a Showroom Shine to Brushed & Polished Stainless Steel surfaces. No oily residue ~ Pleasant odor ~ Water-based ~ Streak-free ~ Deep glossy look ~ Fingerprint resistant ~ Water resistant ~ Dust resistant ~ Anti-smear formula. Ideal for: Appliances, Elevators, Gas Grills, Vent Hoods, Porcelain, Enamel, Painted Surfaces, Fiberglass and Plastics. Use with Flitz Microfiber Polishing Cloth for Best Results. 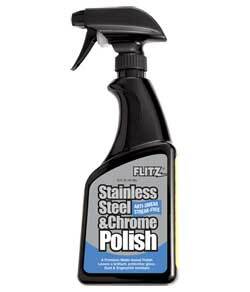 BOOKMARK THIS PAGE STAINLESS STEEL POLISH 16oz.